​​Dak Prescott is taking a hard and firm stance as negotiations over his next contract begin. 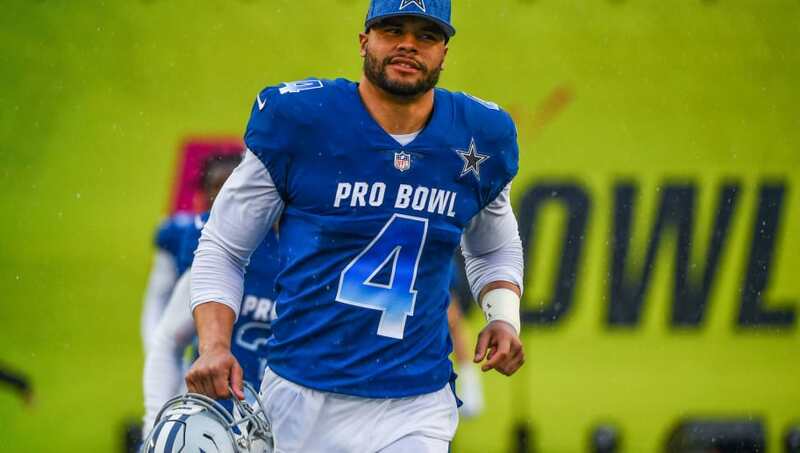 The soon-to-be fourth-year ​Dallas Cowboys quarterback is coming off of his first Pro Bowl season, in which he threw for 22 touchdowns against eight picks and won a playoff game over the Seattle Seahawks. While there has been some rumblings that Dak will/should take a more team-friendly deal in the Tom Brady mold, ​Dak put all that noise to bed with one amazing quote. ​​It's funny as hell, sure. However, the Cowboys have several young players who all need to get paid, and breaking the bank for Dak could throw a big wrench into proceedings. In addition to paying defensive end DeMarcus Lawrence this season, Dallas will have to budget for bringing back running back Ezekiel Elliott, wide receiver Amari Cooper, and, in a few years, linebackers Jaylon Smith and Leighton Vander Esch. The Cowboys will have to do some serious financial gymnastics to keep them all together. Fun question @BryanBroaddus just brought up. Dak Prescott, Ezekiel Elliott, DeMarcus Lawrence, Amari Cooper. If you can only pay three of them, who is the odd man out?